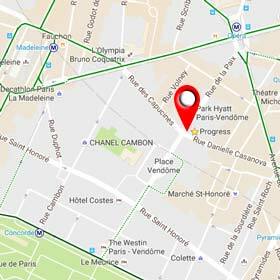 Progress is a French société anonyme with capital of €37,219, with its main office located at 2 rue de la Paix, 75002 Paris, France. It is registered in the Registre du commerce et des sociétés under the number B339739054. The Website is published by Jean-Marc Danton. Designer is Mr. Pascal Rozé – www.rozky.com. Photos are credited to Shutterstock – Progress S.A. The website Progress-search.com is a creative work protected by intellectual property laws. The Site as a whole and each of its individual components are the exclusive property of Progress SA, which is solely authorized to use the intellectual property rights related to them. Use of all or part of the website, in particular by means of reproduction, transmission, display, or distribution other than for your own personal or private use, for commercial or other purposes, is strictly prohibited without the written agreement of Progress-search.com. While browsing our website, statistical cookies may be installed on your device. Progress-search.com uses two types of cookies: analytical cookies and performance cookies. The first one is the Google Analytics Cookie which allows us to build anonymous statistics on the viewing of our website. The performance cookie allows us to monitor any technical problem one may encounter while browsing the website thus finding the problems to solve. Both respect the CNIL legislation. By browsing the Progress-search.com website, you consent to the aforementioned cookies. At any time, you may change the settings of your computer to express and change your wishes concerning cookies, especially the analytical one. Our website might include links to other sites or other online sources where data privacy practices may be different to that of PROGRESS. Visitors should consult the other websites’ privacy policies as we are not responsible for, and have no control over, information that is submitted to or collected by these third parties.